What precautions must farmers take for safety? What about heat safety living in California? What safety training is required by the employer? 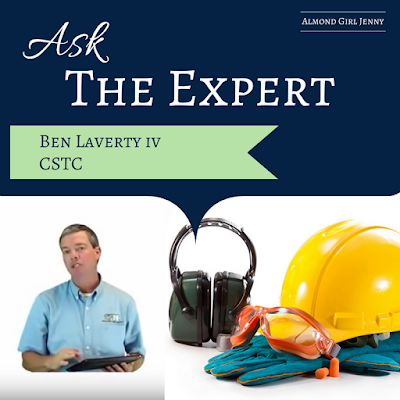 I have been asked some great safety related questions that I knew the perfect expert to call on for help answering your questions! Ask the Expert is a series of posts to answer your questions. I asked you what questions you had about farming and I went out to answer those questions. I am bringing in what I consider industry experts to answer these tough questions and to provide another view point. I am by no means an expert on these tough questions, so I found the experts for you! Next up, is Ben Laverty IV. Ben serves on a farming board with me and I have gotten to know his family through their business. Ben is in the business of helping farmers help their employees. Ben together with his father, Ben III, and sister, Terra, run California Safety Training Corporation. CSTC helps farmers and other business owners protect their employees safety and comply with state and federal laws. Ready to dive in with Ben? AG: How is your family involved in the business? BL: We have been a family business from the inception with all 4 of my siblings and now my 3 teenage daughters helping out. Today, my sister, father and I work together on a day to day basis to see that we help as many people and companies as possible to work safely and efficiently. AG: What precautions do farmers take for heat safety? AG: What are the biggest regulations and laws affecting farmers today? BL: It’s still all about heat illness prevention but we have seen an increase in citations and enforcement in many diverse areas. We focus on compliance as a base and then work with companies to develop the best practices for them. AG: How do you see these changing in the next 10 years? BL: The current trend will continue with an increase in regulation and stricter enforcement balanced with increased use of technology to reduce labor costs and exposure to hazards. AG: How has equipment advanced over the past few decades to improve employee safety? BL: The improvement in equipment has been exponential and is mind blowing; from guarding of tractors to the mobile device revolution, 3D printing, drones, the use of mechanical/technological harvesting and cultivation practices will change the nature of farming. It is so exciting to be alive at this point in the history of the world we have the opportunity to help the world be a better place. Look at us two farm kids blogging :) Who woulda thunk it? AG: What safety training is required by the employer? It was great working with Ben on this safety blog for you all. I hope you have a little more insight into how farmers ensure they operate in a safe manner.